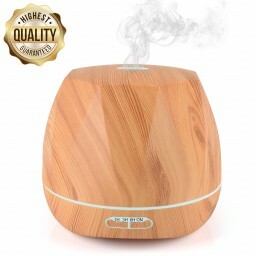 DIFFUSER/HUMIDIFIER: The ESEOE essential oil diffuser is designed with an ultra-modern wood grain that perfectly matches any style of decoration. You can drop your favorite essential oil into the water as it is also a perfect perfume diffuser! Some special oils can create a therapeutic effect. You can also use it as a humidifier without essential oils to add more moisture to your room. LARGE CAPACITY AND GREAT MIST OUTPUT: The diffuser can store 500ml of water in the tank to cover a larger area. In addition, it has a large mist or small mist mode to freshen the air in the room. The mist sprayed by the essential oil diffuser softens dry skin and moisturizes dry skin. Bringing fresh air can alleviate your fatigue, which will allow you to enjoy a quiet and warm atmosphere. 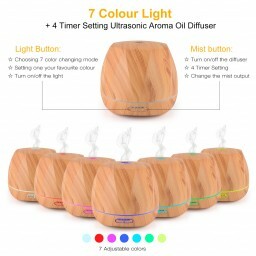 WATERLESS AUTOMATIC POWER OFF FUNCTIOM: The ESEOE oil diffuser uses ultrasonic technology to continuously work for 8-10 hours while maintaining a quiet atmosphere. 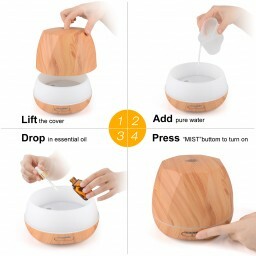 When there is no water, it will automatically turn off to ensure your safety and aroma diffuser protection. You can enjoy a calmer, more relaxed and safe environment, meaning you can rely on our product safety services. 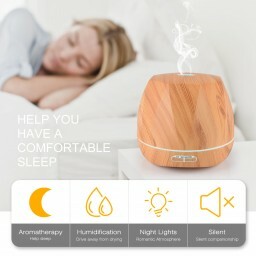 4 TIME SETTINGS AND ADJUSTABLE 7 LED LIGHTS: The humidifier has four time settings of 1 hour, 3 hours, 6 hours and continuous timing, you can set its working time according to your needs ; The aroma humidifier has 7 color LED light that can be cycled or set to a favorite color to match your mood. This means you can enjoy the warmth of a night light while enjoying the humidifier. WHAT YOU GET--- You will get 1*diffuser, 1*adapter, 1*product specification and we offer you an 180-day warranty and friendly customer service. If you have any questions, please feel free to contact us.